Raji, with the other suspects ─ Usman Ibrahim and Adekunle Thomas ─ were apprehended on Tuesday, February 17, in the Gowon Estate area of Lagos. 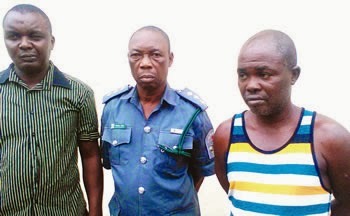 They were arrested by operatives of the Special Anti-Robbery Squad. While Raji disguised as a DSC, Thomas pretended to be Raji’s driver, while Ibrahim was in charge of giving out bank account for victims to pay. It was gathered that Raji told victims that he was in charge of auctioning vehicles and some goods in containers. The police explained that the three usually took their victims to the Wharf, Apapa area to show them the goods and vehicles. A victim, identified simply as Mrs. Uche, was duped of N1.8m when she opted to buy an auctioned Toyota Highlander and paid the sum into an account supplied by the suspects. Speaking with Punch Metro, 63-year-old Raji from Okene, Kogi State, confessed that he had used the customs uniform to dupe victims in Abuja, Lagos and Ilorin, Kwara State. He said, “I am not a customs officer. I decided to buy the uniform to do business. I bought it from a tailor for N5, 000 with all the kits. The tailor did not know I was not a customs officer. “I bought the DSC uniform and rank in 2013. The name on the uniform is Yakubu Lawal. I used the uniform to do fake auction sales. I went to Uche’s shop on Unity Road, Ikeja, and convinced her to pay for the vehicle. She initially paid N800, 000 and then the balance subsequently. Raji, who lived with his family in the Ipaja area of Lagos, added that he became a fraudster after he lost his job with a flour mill. Adekunle, 52, from Ido, Ekiti State, who feigned as the driver, told Punch Metro that he was paid 10 per cent on every deal Raji brought to the gang. Ibrahim, 39-year-old from Kano State, also noted that he got about N250,000 from the deals he participated in. “When we made the N1.4m, he paid me N140, 000. I also got N80,000 from another deal,” he said. The Police Public Relations Officer, DSP Kenneth Nwosu, confirmed the arrest, adding that investigations were ongoing at the SARS into the matter.